After awarding itself additional density, the City is moving ahead with more Regent Park redevelopment. Lots of demolition happened during the past 2 months, to make way for Regent Park Phase 2 (which includes the new community centre). 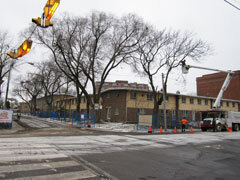 In mid Dec 2010, many mature trees were cut down, and stucco (toxic?) 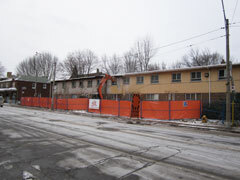 carefully scraped off the townhouses (mid Dec). Demolition started again in mid January and all the townhouses on Sackville Green, including those fronting Shuter St, were gone in 10 days. The original Regent Park included 5 award-winning high-rises, built in 1958. 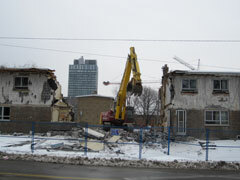 The 14 storey tower at 63 Belshaw Place is currently being demolished. 14 Blevins Place is supposed to be renovated. 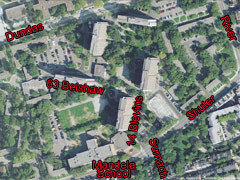 The other 3 buildings are also slated for demolition: 15 Belshaw Place, 42 Blevins Place and 605 Whiteside Place. Well folks it is yet again a Saturday of construction noise. The by-law does not allow construction on Saturday until 9am and no construction on Sunday (see by-law below), also no construction after 7pm which they have also been abusing. Some of us have already called 311 this morning to put in a noise complaint and would appreciate it if you would take the time to follow-up and call as well. 311 said they will try to get a By-law Enforcement to deal with it today but they don’t usually work on weekends. They also said to make note of times and take pictures if possible. All of the neighbourhood is residential including Regent where people are still living in the existing houses that are still standing. The houses at Shuter and Sutton are private homes and do not belong to TCHC. I’m sure the Regent residents are not aware of their rights. FYI the other bylaw they are breaking is the NO HEAVY TRUCKS 7PM-7AM which believe it or not exists on Shuter but have had trouble for years trying to enforce because past council has continually made exemptions on their special interests. Every morning they idle their trucks on Shuter starting at approximately 6:30am and immediately start construction at 7. Not only are they breaking the heavy trucks by-law there is also the idling by-law. I wish I had time to talk about the other by-laws they’ve broken so far, trees, rezoning etc but lets deal with the noise right now.